Over the last 30 years we have created jeweled master-pieces for Royalty and Collectors, including the King & Queen of Thailand. 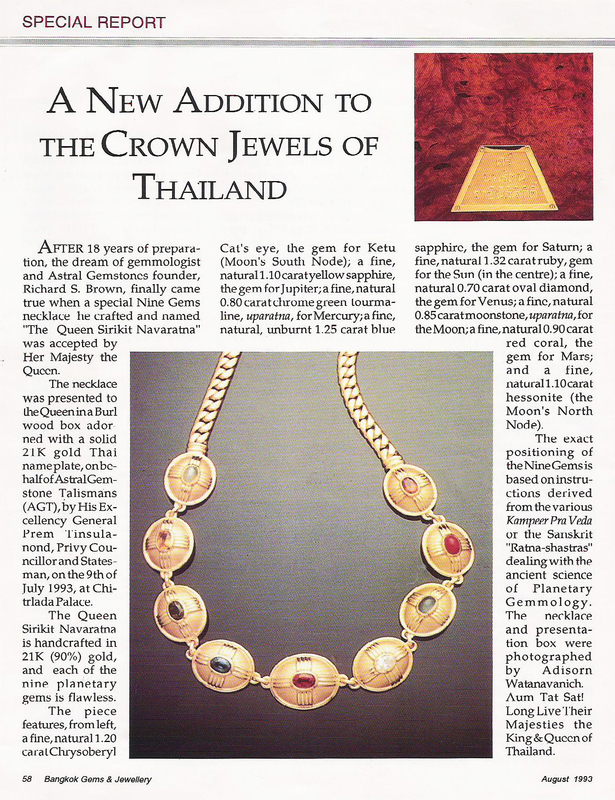 In 1993 we crafted a Navaratna Necklace named “The Queen Sirikit Navaratna” which was graciously accepted by Her Majesty. We also made a number of special presentations to His Majesty King Rama IX, ranging from Sri Navaratna pencil holder all the way through a 2,200 carats flawless crystal ball and culminating in presentation of the sacred Srimad Bhagavatam placed on a jeweled throne. In 2004 we created a Sri Garuda Navaratna pencil holder at His Majesties request. Before presenting the jeweled holder to His Majesty we captured this photograph. 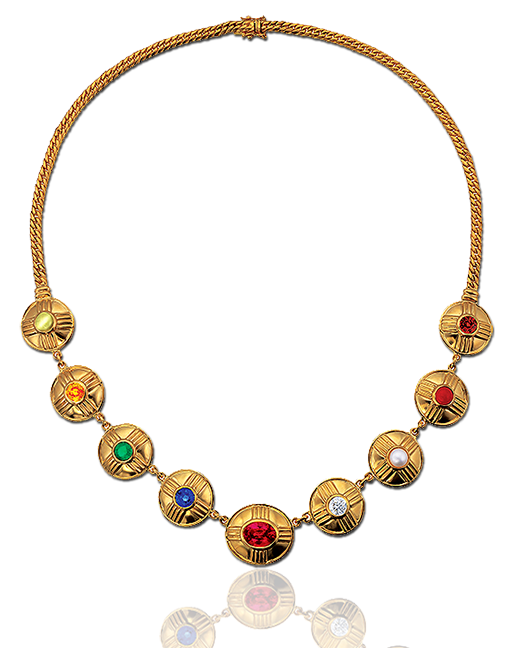 In 1993 we created this Maha-Navaratna for Her Majesty Queen Sirikit of Thailand. 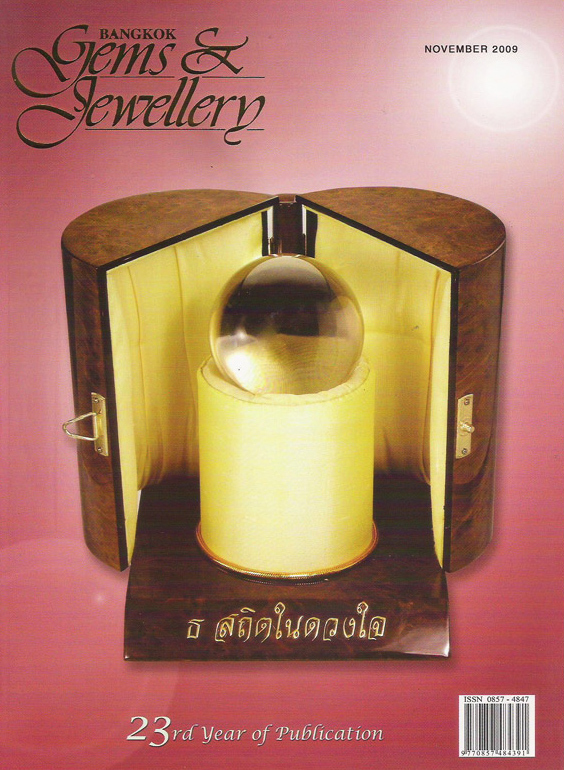 Crafted in pure gold set with the 9 Gems in 1 carat sizes, the piece was presented in a Burl wood box with a gold name plate, “Sri Nopparat Rajanee Sirikit” or the Queen Sirikit Navaratna. In 2004 we created this Sri Garuda Navaratna Ring for His Majesty King Bhumibol. The King felt the ring was too bulky for practical use, and He preferred a Navaratna pencil holder, which we created for His Majesty. In 1995 we collected all 18 volumes of Srimad Bhagavatam translation by Srila A.C. Bhaktivedanta Swami Prabhupada. We had a teak wood throne coated in 9 layers of lacquar built to hold the books, and topped it with a gold name plate. This Sri Garuda Image set with a fine diamond in gold is currently owned by His Excellency General Prem Tinsulanonda, former three time Prime Minister of Thailand, Head of the Armed Forces, and current President of the Thai Royal Privy Council. Special image of HM King Rama V Maharaja carved as a cameo on a flawless red garnet gem and set in gold with the 9 Gems. Special image of H.M. King Rama IX set in gold with the 9 Gems, viz., Ruby for Sun, Pearl for Moon, Coral for Mars, Emerald for Mercury, Yellow Sapphire for Jupiter, Diamond for Venus, Blue Sapphire for Saturn, Hessonite for Rahu and Cat’s Eye for Ketu. This 2000 carats flawless natural quartz crystal cut as a perfect sphere was presented to His Majesty King Rama IX Maharaj on the occasion of His Majesties 80th birthday.